Since Medicare Part A and Part B roughly pay for around 75 percent of all your medical cost, you are now at a fork in the road. You may stay only with Part A and Part B and pay the rest on your own, or you may have a “gap plan” (also called Part C) to cover the rest. Individuals who are entitled to benefits under Part A and enrolled under Part B are eligible to enroll in a Medicare Advantage plan. All Medicare Advantage (MA) plans must cover all Part A and Part B benefits. Plan cost-sharing must be actuarially equivalent to cost sharing under Medicare Parts A and B, but may be different for specific services. Medigap insurance is sold by private insurance companies to fill ?gaps? in Original Medicare coverage. Medigap policies only work with Original Medicare. Medigap insurance does not cover Medicare benefits, but works with Original Medicare coverage. Medigap covers Part A and Part B cost sharing (coinsurance, copayments, or deductibles) for beneficiaries in Original Medicare. Some Medigap policies cover benefits not covered by Part A or Part B of Original Medicare, such as assistance with at-home recovery or extra days of coverage for inpatient care. Medigap helps pay Part A and Part B coinsurance, copayments, and/or deductibles when Original Medicare determines that a benefit is medically necessary. Some Medigap plans also cover benefits not covered by Original Medicare. Available in standardized benefit plans, identified by the letters A – L (different plans are offered in Massachusetts, Minnesota, and Wisconsin). Turning age 65 and signing up for Part B triggers a six-month Medigap open enrollment period when Medigap plans must be issued, regardless of any pre-existing conditions. Good Neighbor Insurance will be able to provide, in most states, a Medical Supplement Plan that will fit your needs. 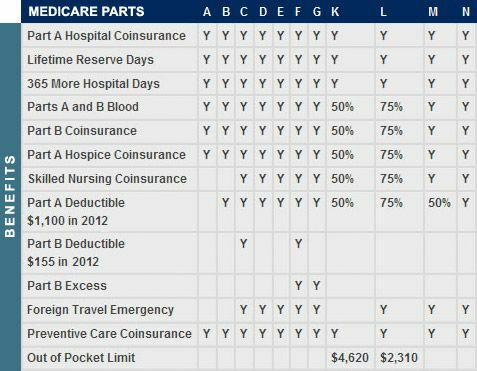 In the Medicare Supplement Plans, you will have an array of options from Plan C to Plan N, with Plan F being the ?best bang for your buck.? Please click on this form and fill out the needed information so we may provide you with a couple of Medicare Supplement Plans that will fit your needs.